What an excellent turn out for the meeting of the West Gauteng branch held on 17 July 2010! Thirty five people, of whom seven were visitors, were packed into our lecture room. Tables had been set up and there were laptops everywhere. Lucas Rinken, chairman, proceeded to give his “hands on” workshop on Legacy, a genealogical program. He used his laptop and the projector to cast the images onto the screen. Each person could therefore see the demonstrations. Legacy has many sophisticated features but the aim of this workshop was to teach the basics. Having explained how to input your own information, he responded to numerous questions. This was followed with a clear explanation and demonstration, allowing time to practise. 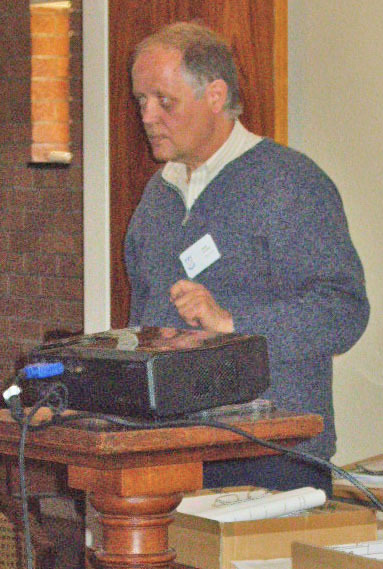 Richard Ford and Dennis Pretorius (left above) acted as facilitators. This was a much needed workshop given by an expert in the use of Legacy. Each person felt free to ask for help, no matter how basic the question. Both the beginner and more experienced members gained by attending an afternoon well spent. Now is the time to put into practise what you have learnt. 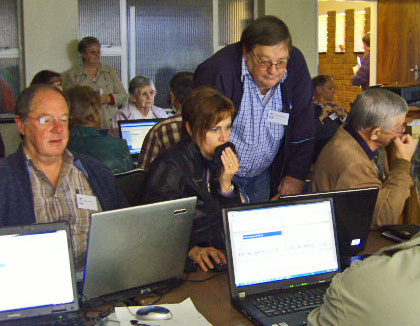 Neels Coertse (right) entertained the members with anecdotes regarding the spelling of names, nicknames and surnames, using names from his family tree as examples. Giel Nel spoke about his first visit to the LDS Family History Centre in Parktown to search for information about his grandfather. He diligently searched the Hoopstad register, going through all entries from 1872 to 1876. Nothing was found. However, he succeeded when he went to the Hopetown register -- here was the baptism date for Gieljan Johannes Nel. We would like to wish a member, Ruth Jobson (left) a very special 80th birthday on 19 July. May you have a wonderful day and many more happy birthdays.